“One book to move you” is the theme of this year’s Canada Reads. From March 25-28, a panel of celebrities will engage in five hourlong discussions, defending their book of choice. Although one book is eliminated each day, the celebrity advocate remains to debate and discuss the remaining books. On March 28th, the winner is chosen. Chuck Comeau of the band Simple Plan defends Homes by Abu Bakr al Rabeeah with Winnie Yeung. Check them out at your local bookstore or library. Listen to the lively debates on CBC Radio One, or watch the show live or streamed on demand on the free CBC Gem streaming service. 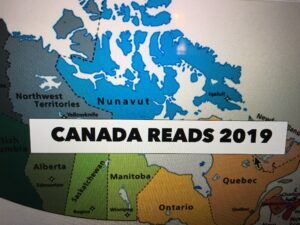 Which one do you think deserves to win Canada Reads 2019?